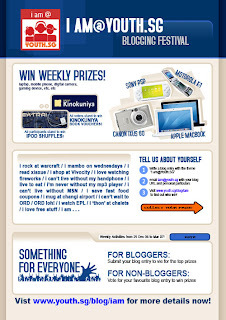 All you need to do is write a blog entry, in your own blog, on the theme “I Am @ Youth.SG”. You decide what “I Am @ Youth.SG” means to you, and you are free to interpret it any way you wish. Title the blog entry “I Am @ Youth.SG”, link it to us at www.youth.sg, and send an email to iam@youth.sg to submit your entry. · Each entry URL should be sent to iam@youth.sg with the email header “I am@Youth.SG – ”. · Participants should include their personal particulars (full name, NRIC/passport number, contact number) and the URL to their blog entry in their email. · Participants can help to broadcast the contest by including the “I am @ Youth.SG” banner (see above) in their blog entry and linking the banner to Youth.SG.